Stars are bodies represented in the navigation console, each of which has a system of planets around it. Stars are colored according to their type which dictates the threat and biomes of planets around them. 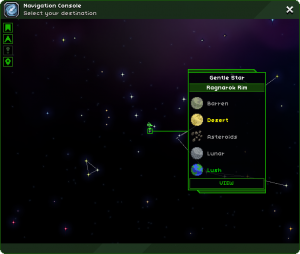 Stars cannot be traveled to—they are unselectable outside the galaxy view of the navigation console. All stellar systems have four regions within which objects can appear (they are listed from innermost to outermost): the Inner Region, which has four orbitals (slots for objects); the Mid Region, which has two orbitals; the Outer Region, which has three orbitals; and the Gate Region, the outermost orbital of the system. In the following paragraphs, X stands in for the tier associated with the star at the center of the stellar system. In the Inner Region and the Outer Region, each orbital has a 50% chance to be filled with an object. When this chance succeeds, one of the following objects is generated to fill the orbital: a tier X planet (70% chance), a Barren planet (5% chance), an Asteroid Field (5% chance), or a tier (X-1) or (X-2) planet (split among the remaining 20%). If a tiered planet is generated in an orbital in these regions, that planet can have up to 2 moons orbiting it, but each one only has a 35% chance to appear. In the Mid Region, each orbital has a 25% chance to be filled with an object. When this chance succeeds, one of the following objects is generated to fill the orbital: a Gas Giant (90% chance), a Barren planet (5% chance), or an Asteroid Field (5% chance). If a Gas Giant is generated, that planet can have up to 3 satellites orbiting it, but each one only has a 50% chance to appear. If a satellite does appear, it is either a moon (10% chance), a tier X planet (60% chance), or a tier (X-1), (X-2) or (X-3) planet (split among the remaining 30%). Gas Giants, though they are selectable in the Navigation Console, have no solid ground, and SAIL will not allow you to travel directly to them, only to one of their satellites. An object always appears in the Gate Region's orbital. This object is either an Ancient Gateway (20% chance), an Asteroid Field (10% chance), a Barren planet (10% chance), a tier (X-1) planet (10% chance), or a tier X planet (50% chance). Tiered planets in the Gate orbital do not get to generate moons. Moons, Barren planets, Asteroid Fields and Ancient Gateways cannot generate with any kind of satellite. Actual blue stars are hot and red stars are cold compared to each other. Frozen stars are a theoretical possibility—they will occur later in the universe when the metallicity of stars (the percentage of metal in a star on average) is several times what is an average of today. This page was last modified on 19 July 2017, at 20:38.